Though resembling donkeys, onagers are desert-dwelling members of the horse family. Originally native to Syria, Iran, Pakistan, India, Israel and Tibet, they’re now restricted to two protected areas in Iran. Poaching, drought and grazing competition from domestic livestock have reduced their population to just 600. 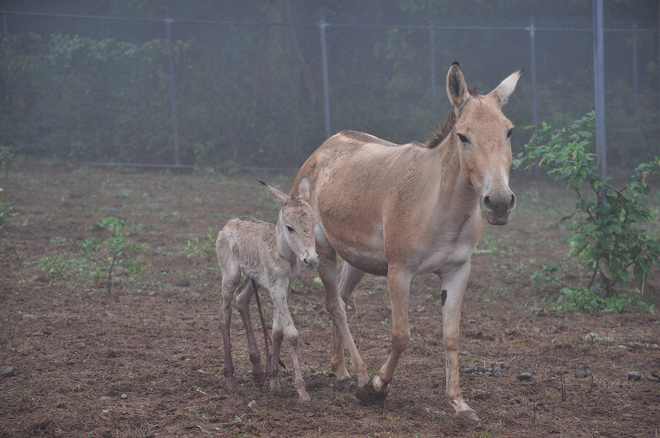 With the addition of this new foal, 26 onagers now live in captivity in North America. The Smithsonian Conservation Biology Institute is part of a joint effort to establish a healthy breeding population as an insurance against extinction.